Connecticut has an opportunity to lead during this critical time for African elephants. By banning the sale of all elephant ivory and ivory products, Connecticut can raise consumer awareness, reduce poaching pressures on elephants, and set a critical example for other countries. Connecticuters, ask your state lawmakers RIGHT NOW to support HB 6335 and pass legislation to ban ivory sales. I am writing to you as a constituent and supporter of the Wildlife Conservation Society's 96 Elephants campaign to ask that you support HB 6335 to ban the sale of ivory in Connecticut. 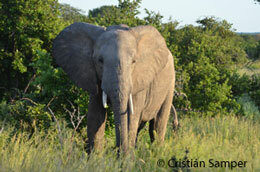 African elephants are being killed at an unprecedented rate as demand for ivory continues unabated. In 2012, some 35,000 African elephants, 96 per day, were killed for their ivory -- representing the worst mass slaughter of elephants since the international ivory trade was banned in 1989. African forest elephants in particular have been devastated by poaching and have declined by about 65 percent since 2002. At this rate, African forest elephants could effectively be extinct over the next decade. The millions of dollars brought in by the slaughter and trafficking of wildlife help finance trade in illegal drugs and arms, which in turn fuels political instability, organized crime, and terrorism. A kilo of ivory can sell for $3,000 and these prospective profits have reportedly attracted terrorist groups like the Lord's Resistance Army and the Janjaweed. By following the money trail it has become increasingly clear that ivory trafficking directly contributes to terrorism and funds atrocities against civilians. Action needs to be taken now to stop the sale of all ivory in Connecticut if we hope to save elephant populations for future generations. Please support HB 6335 and make a difference today.